To keep cold or to keep hot, what is the difference? There is no difference. Thermal energy is thermal energy and it always goes from the hot side to the cold side. Thermal insulation systems are important for two reasons. The first is related to saving energy (money) or losses (boil-off gas). This is always important to some degree or another. The second reason has to do with control of the overall system. If the job is to flow some cryogen from here to there, then it will in many cases never get to there without sufficient thermal insulation. System control also has much to do with safety and operations such as filling, draining, pressurizing, etc. If that cryogenic refrigeration system or that cryogen delivery system has to operate under static situations, dynamics situations, or a combination of those two, then the proper level of thermal isolation is necessary. Thermal insulation systems are systems, not a material. Even a single component thermal insulation system such as "foam" can be very complex depending on the actual-use environment, thermal cycling, moisture intrusion, etc. Multilayer insulation (MLI) inside a vacuum-jacketed (VJ) pipeline is a standard commercial product, is complex insulation system that includes the outer pipe, internal supports, getters, adsorbents, evacuation valve, relief port, etc. The larger point here is that VJ systems drive the overall mechanical and structural design layouts. New! Thermal Energy and Materials Photos! Vacuum or not vacuum, that is the question. The primary discriminator on thermal insulation performance is the vacuum/pressure environment. The vacuum/pressure environment can be divided into three basic performance ranges: High Vacuum (HV) [below about 0.1 millitorr], Soft Vacuum (SV) [about 1-10 torr], and No Vacuum [approximately 760 torr]. The improvement from NV to HV can be up to 1000X even for the same material. But in the total system design, not just any vacuum/pressure level is practical or even possible. The following figure shows what can happen when "vacuum goes bad." Understanding vacuum, vacuum levels, the appropriate vacuum level for a given application, and how to produce or maintain that specific vacuum level is the key to high performance thermal insulation systems. For general helpful reference, here is a handy chart on vacuum levels on Earth and in space: Orbitec vacuum reference chart. What is the connection between mechanical loads and thermal insulation? Most (99% or more) thermal insulation systems also have to provide some structural, load-carrying capability. This structural requirement may be to carry the weight of a horizontal pipe, the weight of a suspended tank (as in the case of a vacuum jacketed tank assembly), within thermal cycling forces, or simply the mechanical loads due to foot traffic or maintenance. To determine the best insulation system for the job, we have to find the right combination the mechanical and thermal properties. Real data for dozens of different insulation materials/systems are included such as foams, aerogels, MLIs, glass bubbles, perlite, and many others. Although we are due to give it a massive update, it currently has dozens of different insulation systems including the LCI. Now we can take a stab at designing the "best" insulation system for the job. The best insulation depends on.....everything! The goal is to keep the internal product/process under the right condition/control at the lowest lifecycle cost. The main requirement may be energy savings, corrosion control, personnel safety, equipment protection, process control, or any number of things. But let's cut to the main factors: environment, thermal, mechanical, and cost. 1. Environment: this is the starting place. Will the insulation materials be working in No Vacuum (ambient humid air), No Vacuum (purged volume), Soft Vacuum, or High Vacuum. There are also more advanced cryo-pumped alternatives including NV to SV or SV to HV. 2. Thermal: What thermal data do you have on each of the materials? For thermal conductivity (mW/m-K) data, do you know the boundary temperatures, test environment, heat measurement technique, thickness, density, mechanical load, surface conditions for thermal contact resistance estimation, preparation conditioning, and so forth? You at least need the first two, or you have nothing. Does the test data match the way the material is to be used in actual service? Do you then have test data on any combination of materials tested in the way you plan to use them? The point here is to beware! You probably won't have all the thermal data you need in the way that you need it. Some informed guesses will have to be made. 3. Mechanical: Heat leak generally goes up as structural load-carrying capability goes up. So you want to design your system with the right components (the materials) that can provide the minimum strength to meet the overall requirements. Mechanical properties can also include weight or density which strongly relates to the thermal performance as well. 4. Cost: Here it is. What everyone wants to know. First, be sure to understand what is the purpose of the insulation and how it is or isn't be treated as a system integrated with the overall system (factory, automobile, power cable, MRI machine, shipping container, etc.). The real cost is the installed system including lifecycle costs. And life cycle cost is another book on its own, including, for example, maintenance, repairs, access for modifications, environmental degradation, recycling, and on and on. Know your component costs (the materials) but understand the total integrated and installation costs for your proposed TIS and the same for the competition/current system. 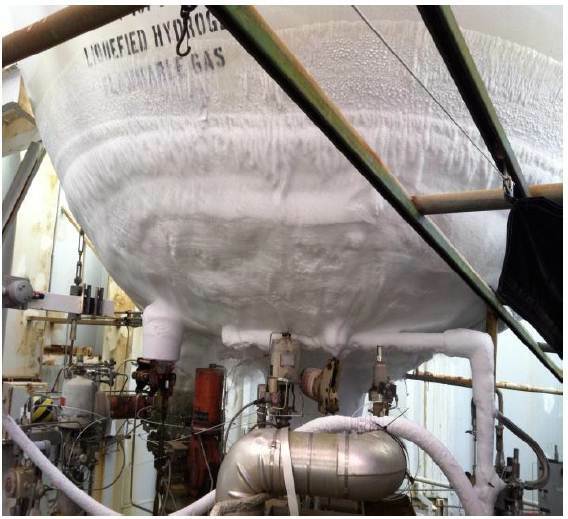 A good example of the real cost of a Thermal Insulation System versus the insulation material cost is given by that of a vacuum-jacketed cryogenic tank. The entire tank design from structure to plumbing to operation is driven by the "insulation." The annular space in this example is filled with perlite powder. The manufacturing includes vacuum gettering systems, vacuum pumpout hardware, vacuum pumping, heated bake-outs and purges, helium mass spectrometer leakage testing, vacuum retention testing, and so forth. The real cost of the "insulation," viewed properly as a system, includes all these things. The bottom line: for a 5,000 gallon LN2 storage tank costing 100,000 USD, the cost of the thermal insulation system is 35,000 USD while the insulation material is only 1,000 USD! To change from one material "A" to another material "B" and only look at this component cost lousy design engineering and bad business.